Based on what I see in quatrain V-23 and how that can be seen as an indication of the missing Malaysian flight MH370, I have searched my Nostradamus database and come up with three other quatrains that seem to fit into a story being told, where a hijacking will be the historically known result (not conjecture, as it is at this point). If one looks at quatrain V-23, the direction points to Africa. The latest news (3/13/14) had the search area widened, to include the Indian Ocean. Based on this quatrain, I could see how a hijacked airplane could be covertly taken to Somalia and possibly used in a future mission, after it had been modified. The expanded search area now includes straights and gulfs, as well as oceans and sea. This means line four can be read as the “fleet divided,” so more area can be covered in a search for the missing plane. Africa is the key point of focus, and the place in Africa that has become known as a place of hijacking (of commercial sea vessels) is Somalia. It is known as where terrorists (pirates) find refuge. Ships that sail past the horn of Africa “tremble” if they do not have military escorts. Look at how Africa becomes joined with Asia in two other quatrains, and see how Venus also appears in them. Venus is a symbolic reference to Islam, and Islam’s influence in Africa has spread throughout the whole continent. The element of Asia is also another place where Islamic influences have become issues, more so in recent years. Of the world’s 1.6-billion Muslims, 1-billion Muslims (62.1%) live in Southeast Asia (per Wikipedia). Read over the Old French text, then my translations (keeping in mind translations can and will differ, intentionally, by design, for deeper meaning to come forth). Duumvirat par la classe desjoinct. Crys, pleurs à Malte & coste ligustique. Court of two by reason of there fleet divided. Both will transform there portion Oriental. To read “Sea by stars” (where solaires is seen as distant “suns,” thus “stars”) shows a nighttime event involving a ship, where air-ships sail on the waves of the dark sky, lit up by tiny islands of land. To the period of time when Nostradamus lived, the thought of air travel would seem reversed, as if the night sky became the “Sea” that “contained” “stars.” The word “seure” means “sour,” thus a “sharp” taste; but in connection to quatrain V-23, where “two contained elements” are combined “together,” making a poisonous gas, it might now be identified by the taste, or a production made from an acidic element. The word “passera” is the future tense of “passer,” which can mean “will hold on course,” “will let go,” or “will overreach” (among many other possibilities). Many of the flags of Muslim nations bear the Crescent moon and star. That “star” is actually the planet Venus. Nostradamus links Islam to the Moon and Venus, while Christianity is linked to the Sun. The statement that “Islam will hold all Africa” is quite true today; but that would not have been the case prior to the 20th century. This is then a timing element, where it can reflect on the main theme (line one) as when Christianity (“solaires“) will sour and no longer proceed to seek most of the central regions of Africa. For those wishing to hold out hope for loved ones on flight MH370, line two can be read to state, “Those whose flight did not stay on course will go to a Muslim nation, which will be holding all of them as hostages, in Africa.” When this is combine with quatrain V-23, where it says, “majority in March being” (“pluspart à Mars seront“), the realization of this hostage situation may not be known before the 24th of March, or after missing 16 days, which is more than half of the 31 days in March (the “majority of March”). The capitalized word “Sol” is another place where Christianity can be found, especially as an outreach from the Roman Catholic Church, when “Sol” is recognized as the Latin word for Sun. However, in French the word “sol” primarily means, “ground, soil, land, earth, foundation,” before it means Sun. The capitalization is then an indication of the majority of the “Land” of Africa, or from North Africa to the borders of South Africa, being where Islam has “more rule.” That “reign” will be gained through “Saturnine” exercises and “Harsh,” treatment of those unwilling to convert to Islam. The combination word “n’occupera,” meaning “not will occupy” or “will not usurp by force,” is then reminiscent of the U.S. military involvement in Somalia, where the resistance forced those troops to withdraw, not allowed to be employed there without a full declaration of war. Into the year well adjoining not driven far off from Islam. Outcries, lamentations in Malta & coast ligurian (northwestern coastal Italy). When line two begins with “Les deux,” it links this quatrain’s secondary theme (line two) to the main theme of quatrain V-23. This is a focus set on “two” important versions of “Them” (the plural pronoun translation of “Les“). This is then a major statement of “two” opposing sides, creating an Us versus “Them” mentality, where each side is “Them” against the other. Whereas quatrain V-23 places focus on “The two contained ones being united,” quatrain IV-68 then adds that “Those two” are “more” aligned together and also “more mighty ones,” through their alliance. When the word “grans” is seen as being a contracted plural form of “grand,” which indicates a superpower, then nuclear weapons becomes the root determination for “greatness.” In Asia, the countries who possess nuclear weaponry are: China, North Korea, India, Pakistan, and the nations of the former Soviet Union (Russia and friends) in Asia. The one Asian country attempting to “benefit” from this “mighty” possession is Iran. The “two” who boarded flight MH370 with stolen passports purchased by Mr. Ali were Iranian, and they had stayed with another Iranian before getting on that flight. The placement of an ampersand means an important point of separation (not addition), such that “to Africa” becomes the place where the “two” would go, from “Asia,” to outside that entire continent’s powers, “to Africa.” Quatrain V-23 told of “Him great,” which can now be seen as “It great” or “It mighty,” as a nuclear bomb of some kind, which will go “to Africa” to be used “as terrorists” see fit. The aspect of “From the Rhine” can then be applied to the known traveler who was said to be going to a destination in Germany, where his mother had sought asylum and had it granted to her. If nothing more than a symbolic microcosm of the greater intent, a German (EU) destination can be where the “terrorist” will be from, while “to Africa.” It may be that a Boeing 777 was hijacked because it had a nuclear weapon on board (in its storage compartment with the luggage), and either or both are planned to be used to transport “terrorism” to the region of the Rhine River. Since this is getting well beyond the scope of what is known at this point, it is irresponsible to interpret further. However, this quatrain, when linked to V-23, supports that Africa and Asia are united together in terrorism. Piercing (Hot) direct will provoke them contained ones. I will not go into an interpretation of this quatrain at this time. I will say that the wording of this quatrain, where the main theme begins with some important man, as “Him,” who is a “seducer, misleader, or deceiver,” is intriguing to me. Line one also leads one to focus on a “pit, hole, ditch, channel, fort, camp, or cave.” The world’s foremost terrorist who was a known cave-dweller was Osama bin Laden. The United States Navy, SEALS ordered by President Barack Obama, reportedly executed that important and wanted “Him.” In the process of their successful sneak attack and targeted kill, bin Laden’s body was reportedly tossed in the Indian Ocean, supposedly because the Koran demanded immediate burial … at sea. I think it is interesting that the Indian Ocean is now a search area for the missing flight MH370, because some exercise of revenge could make that a place to make a symbolic statement. Dumping up to 239 bodies there, along with a Boeing 777, would be a chilling sign of an escalation in the War between East and West. Additional Note: The anniversary of the Osama bin Laden raid, death, and disposal will be May Day – May 1. I will make more updates to this post later. I welcome everyone to visit my website that explains many other quatrains ofNostradamus in articles of depth. You may be able to see how this scenario fits into a theme that everyone should be aware of. Thanks again. Keep in mind that we can manage our future, making it possible to avert some bad things coming, but the past is fixed as the lessons that have created the present, and the present is unfolding towards the future. Note: Due to this plane being missing for an extended period of time and all of the conjecture that has surrounded what known facts, I have posted an article on my website that will fully explain this quatrain, according to the systems of analysis that make Nostradamus understandable. That will keep me from adding to this post, making it difficult to follow. I have fully explained the first line of quatrain V-23, and the wording reveals how the missing plane can be only one element of a greater scheme. You may find that article here. At this point in time (March 19, 2014) only line one is explained in depth. 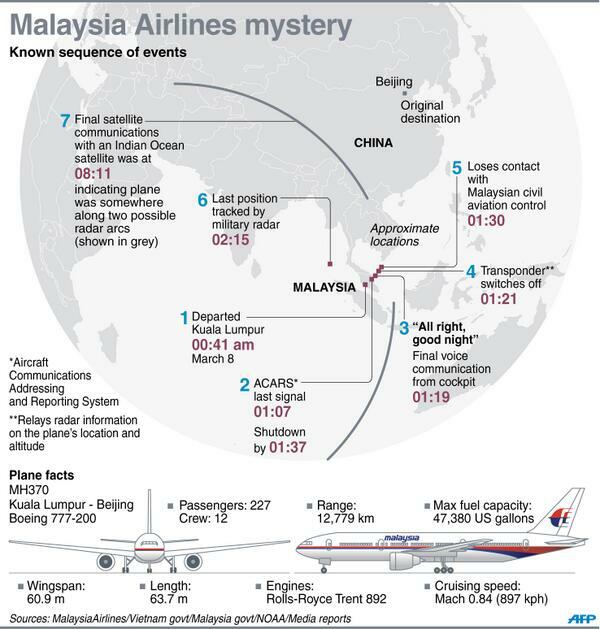 I will add further explanation, explaining lines 2, 3, and 4, and how those relate to the main theme in line 1, until the full interpretation is completed, as long as the missing flight MH370 proves to be supported in the verbiage of quatrain V-23. Note: Due to this plane being missing for an extended period of time and all of the conjecture that has surrounded what known facts, I have posted an article on my website that will fully explain this quatrain, according to the systems of analysis that make Nostradamus understandable. That will keep me from adding to this post, making it difficult to follow. I have fully explained the first line of quatrain V-23, and the wording reveals how the missing plane can be only one element of a greater scheme. You may find that article here (line 1) and here (line 2) and here (line 3) andhere (line 4). All lines are explained in depth, based on systemic methods that must be applied to every quatrain. The missing flight MH370 proves to be supported in the verbiage of quatrain V-23, but that event is a foreshadowing of greater events to come. If it doesprove to have crashed in the south Indian Ocean, I doubt this quatrain will be primarily focused on that flight, although it could still play a role in understanding the main intent. If quatrain V-23 is strongly about the missing Malaysian flight, the airplane will be found mostly intact, at this late date that would mean on land, with the continent of Africa being the location. All that remains to be seen, but the quatrain is about greater issues that have been raised since the missing flight came to the forefront of our consciousness. Les deux contens seront unis ensemble, Quant la pluspart à Mars seront conjonict: Le grand d’Affrique en effraieur & tremble: Duumvirat par la classe desjoinct. Them two contained ones will be joined together ones one with another, When there majority in March being coupled with: Him great African into terrorist & trembling: Two-man court by reason of there fleet parted. I believe this quatrain tells the whole story, with the current news only the tip of the meaning that will unfold. I believe the main theme statement (line one) indicates two people working in concert, such that each took on a chemical of some kind on board, perhaps in a travel bag or carry-on. Each would be inert alone, but when combined the two agents will create something, possibly a gas that (minimally) put the pilots in an unconscious state, one that prevented them from making an emergency call, or killed the pilots (if not all on board). This combination did not create any explosion, as line two indicates the possibility that the plane will be found mostly intact. Line three confirms it was an act of terror, thus not a natural occurrence or accident; and line four states a “fleet” is involved in some way, which can be air and/or naval. Update (March 21, 2014): A 6.7 magnitude earthquake occurred near the Nicobar Islands of India, according to news reports. The Nicobar Islands are largely un-populated, but they are close to peninsula that joins Thailand with Malaysia, and north of the western tip of Indonesia. This fits the use of “tremble” in line 3, where an accent mark makes it the past participle of “trembler,” as “tremblé,” meaning “shook, trembled, quaked, and shivered.” It is important to realize the order of the words, such that “to Africa” (“d’Affrique“) will occur before the “tremble.” No tsunami is predicted from this quake, but a 6.7 earthquake is significant. Update (April 1, 2014): An 8.2 magnitude earthquake occurred off the northern Pacific coast of Chili, causing a tsunami and considerable damage to homes and power, according to news reports. This is in addition to lesser scale earthquakes in the Los Angeles, California area, the last week in March. There are more ways to read this quatrain, and depending on the findings about the disappearance of flight MH370, this quatrain may or may not stem from that event. However, at this early stage it does fit the main theme (line 1) well, with a possible scenario that would have subsequent events also match well. We will have to wait and see what those findings are and if terrorism is indeed the cause. I welcome everyone to visit my website that explains many other quatrains of Nostradamus in articles of depth. You may be able to see how this scenario fits into a theme that everyone should be aware of. Thanks. Keep in mind that we can manage our future, making it possible to avert some bad things coming, but the past is fixed as the lessons that have created the present, and the present is unfolding towards the future. Note: Let me interject now and say that Nostradamus did not randomly write about world events. If quatrain V-23 is indeed about the missing jetliner, it is one piece of a mosaic, as part of a larger picture. This means this quatrain will link to others, which tell of events past and future, about an act of “terrorism” in a “War” where that is standard procedure. Key terms that repeat link quatrains together. In this quatrain, “deux, contens, d’Affrique, effrayeur, and classe disjoinct” may be found in other quatrains that will be found to add more details that are missing here. Again, this news story is just in the beginning stage, so it has not yet unfolded as documented history. I just wanted to add that one quatrain does not the whole story tell. Update: I have searched the key terms listed and come up with some interesting quatrains that combine Asia with Africa. I will not go into these quatrains in this posting, but if you know how to do an Internet search, see what you think about quatrains V-11 and IV-68. Make a comment if you feel so moved. Note: Due to the reported change of direction the flight made, taking it back over Thailand-Malaysia, last spotted in the Malacca Straight, if that westward flight remained along the 2S degree of latitude, it would head to Mogadishu, Somalia, in Africa. That would be approximately a 4,000-mile flight, which should be within the capabilities of a Boeing 777 (Wikipedia lists the range between 5,200 and 9,300 miles). This is a broader view of how line 3 supports the event begun in line 1 – “to Africa” (d’Afrique”). Update (March 17, 2014): After CNN seemed to not be able to show the double-circle graphic on Sunday (March 16, 2014), that completely disappeared on Monday. The “search area is set at a 2,500-mile radius from the point of the plane making its sudden turn around. There has been absolutely zero suggestion that Africa could be a place for a big jetliner to go, while they talk incessantly about it flying over Indian and Chinese airspace, “in pockets that could go undetected.” The distance a Boeing 777 can fly (according to the Wikipedia article) is “5,235 to 9,380 nautical miles (9,695 to 17,372 km),” I would imagine depending on the weight being transported and whether or not it was flying against prevailing winds. However, an Internet search of the distance between Shah Alam, Malaysia and Mogadishu, Somalia found it was 3,883 nautical miles (6249 km), which is well within the limits of a 777. The distance between Kuala Lumpur and Beijing is 2,287 miles (3,680 km), with it 3,070 miles to Tajikistan, which means that is certainly a shorter distance than the Horn of Africa. Keep in mind the 200 miles the plane flew to the Gulf of Thailand and then back to the Malacca Strait adds to the use of fuel, without adding to calculated distance of a destination. Still, Africa would seem to be a “no-brainer” option for a plane flying west, at last radar contact. The Malaysians have reportedly said the plane was filled with a “normal amount of fuel, enough to get it to Beijing,” but no airplane is ever filled with “just enough fuel” to get it to it’s destination. There is always more than enough because a plane may have to divert to another airport or circle if the airport it is headed to has congestion on the runways or weather delays. A plane costs many millions of dollars to purchase, so sparing a few bucks on fuel would not make it worth having the plane crash, and then have someone announce the crash was because it “ran out of gas.” However, there is an optimum weight the plane can fly (as far as “MPG”), which includes the weight of fuel, so planes may not be full for medium distance flights. I would think a 3,000-mile flight would require an almost full “tank” (planes have wing tanks and a belly tank), since the distance of all the hijacked planes on 911 were to destinations around 3,000 miles, and much was made of their tanks being full. Meanwhile, President Barack Obama has his mind on the developments in Ukraine and Crimea (and also the continuing failures of his Affordable Care Act), such that has nothing publicly to say about what U.S.Intelligence could offer about a possible theft of an airplane, one that could be used as an instrument to attack Israel. The Israelis are willing to make announcements, but not American government officials. The American propaganda mechanism (Hollywood) makes us think U.S. science and technology knows everything that could be known and what everyone is doing at all times. We see movies and television shows where planes are hijacked, but not to worry because some American-British-born actor will single-handedly kill all the terrorists and save the day, even if a few innocent “extras” get killed in the process. The silence of American Intelligence about Crimea, and now a missing plane, shows America has the “pockets that go undetected” problem, not India and China, … or everyone in power knows a lot more than they are letting us know. Intersecting pings are said to mean the plane was at some place on each circle when a ping was received – not in between. Notice the outer circle. It touches the tip of the Arabian peninsula and cut in the middle of the Maldives, where it shows the satellite’s position. New Update (March 18, 2014): According to this report, the plane was spotted (or one that looked just like it, at the same time that one was missing) flying low over the Maldives. The Maldives are islands southwest of India, in the Indian Ocean. That means it was avoiding radar and headed towards Africa. Look at the map above, which shows a destination of Mogadishu (not to the Horn of Africa) and you see the line drawn goes through the Maldives. Hopefully this information will be examined further. Update (March 21, 2014): In regard to the reported siting(s) in the Maldives, this is what I heard on cable news on March 19, 2014, when all discussion went to the south Indian Ocean as a possible crash site. I heard someone ask, “What about the sighting in the Maldives?” Someone off-screen said, “Oh, that was discredited.” Then, a woman host began reading notes, while saying, “The Prime Minister of Malaysia called the Prime Minister of the Maldives and inquired about the sightings and was told, ‘There is no truth to the sighting.’” Oh. Okay. No multi-million dollar Navy ships and special airplanes to check out that rumor? I think Time Magazine should do a new yearly edition called, “Liars of the Year” and either put the Malaysian Prime Minister’s or the Maldivian hut-dwellers on the cover. The only sighting is poo-pooed and the sleight of hand news keeps pointing to places that only an uncontrolled jet would go. That is with all evidence showing a purposeful redirection and altitude changes. Maybe the hijackers had a heart attack after locking the cockpit door and turned the jet around, then just flew off course until it ran out of fuel … or maybe it landed in Africa or Iran and everyone got out and walked away? Read my in-depth analysis of the words in quatrain V-23 on my website Katrina Pearls. 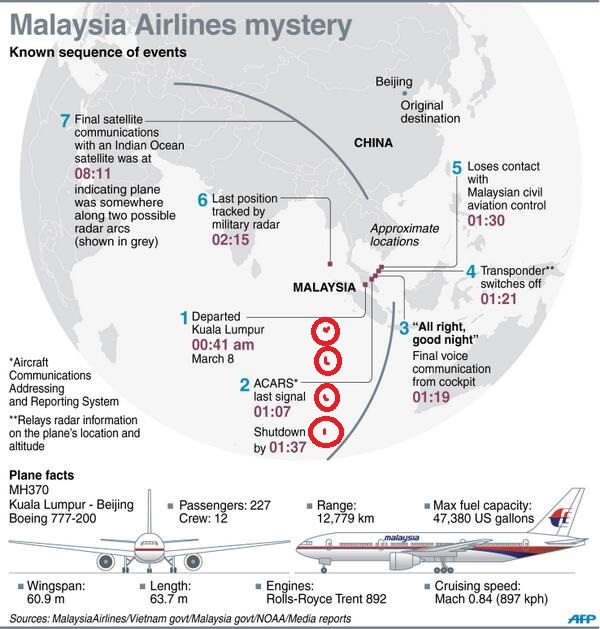 Under “Services” (on the top toolbar), choose “Nostradamus,” then click on “Articles,” then scroll down to the last link and click on “Quatrain V-23 as Pertaining to the Missing Malaysian Flight MH370.” Or click here. Update (March 24, 2014): The Malaysian government has announced that flight MH370 crashed in the south Indian Ocean and everyone on-board has died. Makes me remember how Osama bin Laden is still missing at sea and presumed murdered by Navy SEALS. Seems we accept government officials announcing deaths, without question. Until a wing or something that can be specifically identified with that specific Boeing 777 (and not some part that could be taken off a plane without keeping it from flying, and then tossed in some sea), this whole event become more important and not over, in my mind. Until they “Show me the proof,” it should make all defense mechanisms in Western nations go up. The reasons are many: 1.) Why did Malaysia say nothing in the beginning, about radar tracking in the Strait of Malacca, when every ship on the South China Sea was searching for three days because of some Chinese satellite spotting “possible debris”? 2.) Why did Indonesia refuse to let search planes have the right to fly over its air space (March 18, 2014 article), to see if the plane possibly crashed on land there. They cited “international bureaucracy,” saying permission forms had to be filled out first. Ten days after a plane goes missing, why would they refuse to help look, unless some evidence might still be visible by air then? Did you know there are two airports on the Indonesian coast, not far from where the last radar was detected? The plane could have landed there and refueled, with a full load to go anywhere within 7,000 air nautical miles. Could there have been something left behind, still uncovered, that could have indicated a plane landed there? Why isn’t anyone asking that question? 3.) The ping at 8:11 AM (Malaysian time) proves the airplane was still flying 7.5 hours after take-off (12:41 AM) and nearly 6 hours after Malaysian military radar last spotted it (2:15 AM). I have since heard the 8:11 AM ping as not being so fixed at that specific time, but amended to state, “Not later than 9:15 AM” Why is that? 4.) If the plane was expected to make a secret landing, for the purpose of refueling, it would be a direct flight from Medan, Indonesia to Mogadishu, Somalia, of 3,685 air miles (here), with a flight time of 7 hours, 37 minutes. A descent to 12,000 feet may not have been for any other reason than it making a landing approach. The satellite ping at 8:11 AM indicated a CIRCLE (not two arcs) of potential positions, such that a full fuel load would make it possible for the plane to reach all points in that circle. That circle was shown as just off the Somalian coast, at its northern tip, where the Horn of Africa is. 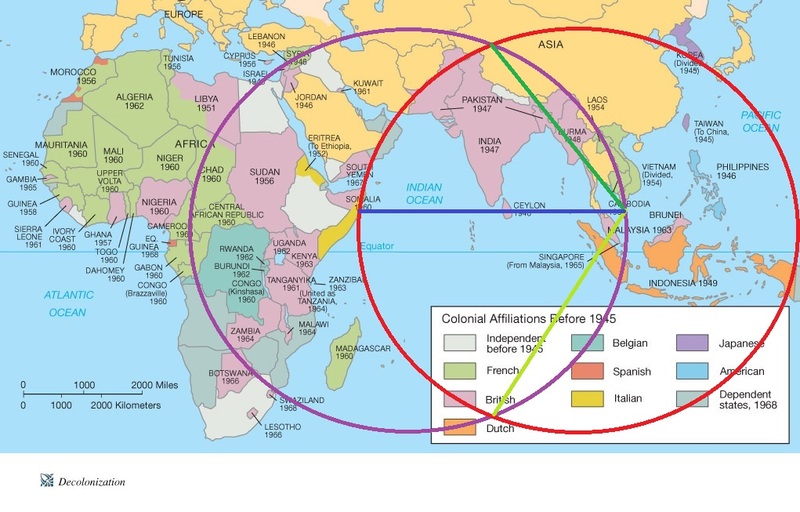 A point on that CIRCLE that would be in line with Mogadishu as the intended target destination would be about 500 miles away. Thus, from a 2:15 AM radar sighting, adding time for a 1-hour land and refueling, would mean roughly 5 hours of flight time when last detected, to reach a point 3,100 miles away, or flying at 620 mph. The cruising speed of a Boeing 777 is .84 Mach (at 35,000 ft), which is 639.4 MPH. The ping at 8:11 AM does not mean the plane was on the ground (or in the water). 5.) There were eyewitness accounts of a sighting over one or more of the Maldive islands, saying a large white plane with a red stripe was seen flying low over their houses at 6:15 AM. It is roughly 1,784 miles from Medan, Indonesia to the general area of the Maldives. Flying at 600 mph, the flight time would be roughly 3 hours. So, if a refueled plane took off from Medan at 3:15 AM, then that would put it over the Maldives around 6:15 AM. If the plane had not refueled in Indonesia, but did refuel in the Maldives, at Malé, then a take off at 6:15 AM would would automatically have it flying low overhead, because it had just taken off. 6.) If the plane were hijacked to be used in a future event, perhaps with a bomb on-board, it would be doubtful anyone would claim to know where it was, and it would be probable some nation(s) would be complicit, making refueling possible – in Indonesia (Medan) or Maldives (Malé). 7.) The two Iranians who boarded with stolen passports has been completely forgotten, as if that lax of security is commonplace. Their presence on that flight makes an act of terrorism more likely, and less likely that it was just bad luck they went to all that trouble to board a doomed flight, crashing in the south Indian Ocean. Update (March 28, 2014): The news has reported that debris has been spotted by surveillance airplanes and buoys have been dropped to guide the ships to the debris. We can only hope and pray now that it will not be the U.S. Navy SEALS that find the debris, then have them tell us they checked the serial number and found them all to be exact matches to the missing Boeing 777, only to then dump the debris back into the Indian Ocean, leaving us to believe they would never lie. Consider the ocean currents and wind currents of the Indian Ocean, and all the noise that has been generated about some “zombie plane” flying south, until it ran out of fuel and crashed. Notice the wind current that naturally flows from the last point of radar contact to Somalia. Then notice the ocean currents that also flow towards Africa or towards Indonesia, but not south. 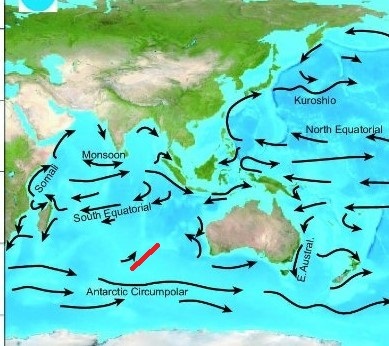 The red line debris field is following the natural ocean current northward, but that branches off the Antarctic Circumpolar. But, “zombies” can do unnatural things, I guess. Or, maybe we will finally know where Amelia Earhart’s plane ended up? Update (April 7, 2014): The Malaysian government updated their hypothesis of the flight path of MH370, saying it never crossed into Indonesian air space, with CNN reporting the Indonesians denied having radar tracking of the flight after it was lost over the Strait of Malacca. This is a near impossibility, as to fly around the tip of the Sumatra island would be the presence of an unidentified aircraft within their radar range. Indonesia has better air security than that, I would imagine. CNN pilots-experts confirmed that this air corridor (SE Asia) is highly active, at all hours of the day. To fly without communication would endanger other flights in the air, even at the early morning hour (2:15 AM). To go around the tip of Indonesia (Sumatra) and then turn south, to the forsaken wilderness of the south Indian Ocean, would mean a purposeful suicide-murder expedition, which makes no sense, as the passengers and flight crew represented innocent lives; and to take those lives would mean suffering great torment and punishment by Allah, to Muslim pilots. The discovery of a possible “needle in a haystack,” from pings heard by dragging a microphone behind a Chinese ship, and then an Australian navy ship hearing noise a hundred miles away that is “promising,” is miraculous, if not completely beyond belief. What is interesting to me is the theory presented soon after the plane went missing, of the possibility it could have flown north (over land), if it had shadowed another aircraft. Could that not be what happened when Malaysian military radar lost track of MH370? Could the altitude drop, to 12,000 feet make it disappear because a smaller aircraft, taking off from Medan, reached 12,000 feet near the same point, with the smaller aircraft turning north, with MH370 landing in Medan? Why isn’t more being said about the climb to 45,000 feet, and the subsequent descent to 12,000 feet? Where did that happen? How long was it at those altitudes? How do they know this? It would be a blessing to the families of the missing to have a conclusion to this matter, but a month into the investigation has us waiting.